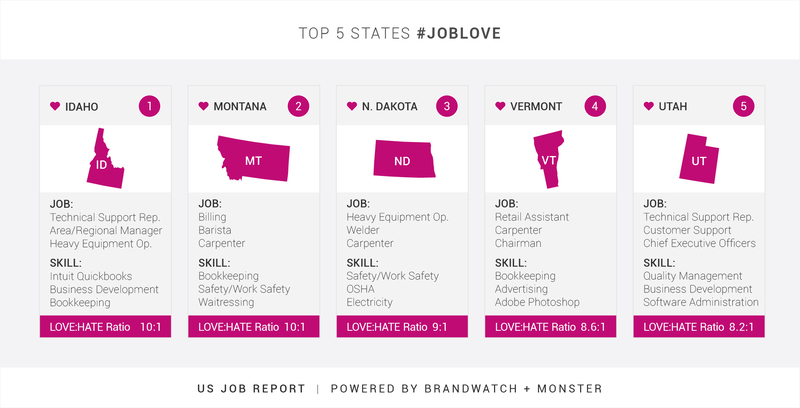 Analysis of over 2 million tweets about job sentiment indicates significant shifts in where people love and hate their jobs in the U.S.
Monster (NYSE: MWW), a global leader in connecting people to jobs, and Brandwatch, the leading social intelligence company, today announced the results of their second annual Monster and Brandwatch Job Report, a social media study of job sentiment and corresponding interactive infographic on the insights. 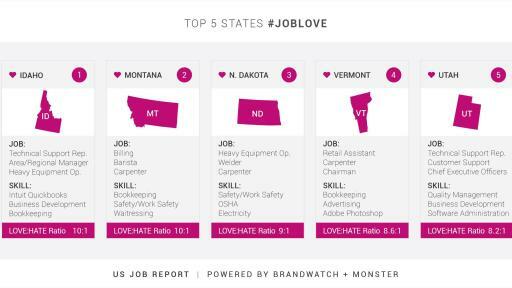 Revealing where people love and hate their jobs the most in the U.S., the study also analyzed exactly who, what, when, where and why people take to Twitter to discuss how they feel about their jobs, and how those findings differ from the 2015 report. Where do the lovers and haters live? When are people loving and hating? During this study, conducted April 2015-March 2016, Monster and Brandwatch also analyzed how social media job sentiment varied by specific months and days. While July remains the most hated month of the year, October is now the most loved month, a change from last year’s top month for job love, November. There has also been a shift in the days of the week that U.S. workers tweet most positively about work, with Thursday overtaking Friday as the day with the highest job love-to-hate ratio. 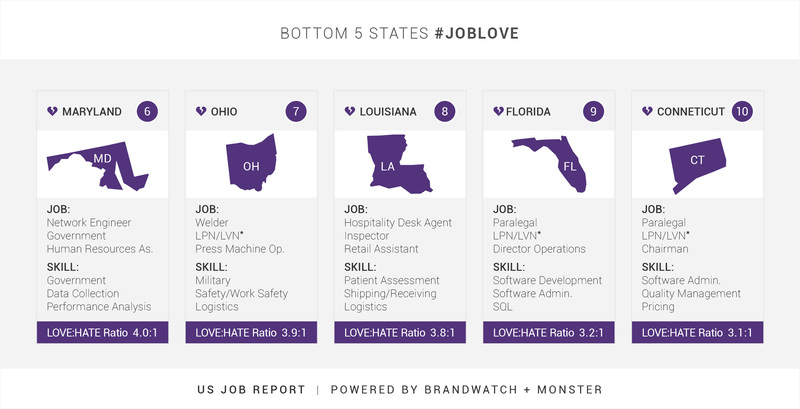 Building on data and insights from the 2015 Monster and Brandwatch Job Report, Monster and Brandwatch used Brandwatch Analytics to analyze and compare more than 2 million English-language tweets across both reports, searching for conversations that included words and phrases indicating loving or hating their jobs. In-depth analysis within the study also utilized Monster data on the top skills and job titles in the US. 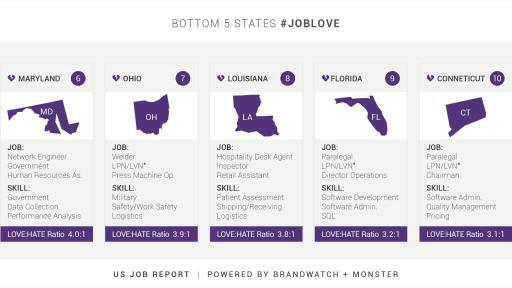 For the full report, including details on the top jobs and job skills in each state, gender demographics of loving vs. hating US jobs, and why people hate their jobs, visit the Monster and Brandwatch Job Report. Brandwatch is the world’s leading social intelligence company. Brandwatch Analytics and Vizia products fuel smarter decision making around the world. The Brandwatch Analytics platform gathers millions of online conversations every day and provides users with the tools to analyze them, empowering the world’s most admired brands and agencies to make insightful, data-driven business decisions. Vizia distributes visually-engaging insights to the physical places where the action happens. The Brandwatch platform is used by over 1,200 brands and agencies, including Cisco, Whirlpool, British Airways, Walmart, and Dell. Brandwatch continues on its impressive business trajectory, recently named a global leader in enterprise social listening platforms by the latest reports from several independent research firms. Increasing its worldwide presence, the company has offices around the world including Brighton, New York, San Francisco, Berlin and Singapore.